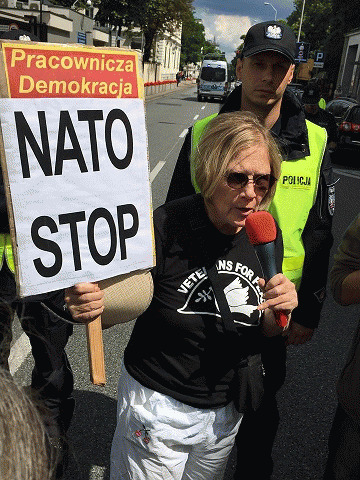 I just returned from Poland where I was speaking at a NO TO NATO, NO TO WAR Conference and rally in Warsaw. Earlier this week I spoke with a young man in Krakow, Poland who described the ironies of holding the 2016 NATO summit in his country. Tomas, a university trained historian and now tour guide, reminded me how Germany, one of the strongest partners in NATO, invaded Poland on September 1, 1939. As Tomas commented, "Seventy years ago Germany virtually destroyed Europe and ironically now is the most powerful country on the continent -- again. During World War II we in Poland had our land taken, our people murdered and then with the defeat of the Nazis, we were given by the U.S. and the U.K to the Soviet Union and had to endure decades of communist rule while Germany was rebuilt and prospered. 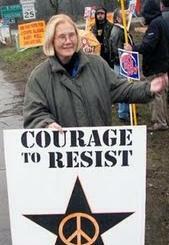 Now again, we find ourselves in midst of a military confrontation that will do no one any good." He added, "I do not believe the Russians want a war and I wish the US missiles would not be on Polish soil as we become a target again. I don't like that we are having big NATO military exercises in Poland -- it's giving our politicians the rationale to reintroduce mandatory military service which I do not want. Where are these NATO countries getting the idea that Russia is going to invade anyone? I just don't see it." During World War II, Nazi Germany wrecked havoc on the people of Poland -- Jews and Poles alike -- as they colonized the whole of Poland, enslaved the entire population and quickly began exterminating minorities in their campaign to eliminate all but the Aryan race. Entire cities were cleansed and given over to German families and many of the cities, such as Warsaw, were destroyed by the Nazis as they fled at the end of the war. Six million Jews from all over Europe were executed, gassed and their bodies burned. 2,400,000 Poles, 3,000,000 Ukrainians, 1,593,000 Russians, and 1,400,000 Byelorussians were killed in Poland during World War II. The Soviet Union joined Nazi Germany on September 17, 1939. The Soviets killed 22,000 Polish Army officers and intellectuals in May 1940 in the Kaytn forest, a massacre the Soviet Union did not officially acknowledge until 2010. The Nazi-Soviet alliance didn't last long with Germany double-crossing the Soviets by invading the Soviet Union in June 1941. In 1945, the Soviet Union pushed Nazi Germany first out of their country, then out of Poland and other areas of Eastern Europe at the expense of 27 million Soviet lives. However, Poles will not forget that the Soviet Union waited across the Vistula River to liberate Warsaw until the Nazis had murdered virtually everyone in the Warsaw uprising. Stalin had struck a deal with Roosevelt and Churchill and the Soviet Union was rewarded for its key role in defeating the Nazis by acquiescence of the United States and Great Britain to Soviet control of the Eastern block countries, including Poland. For 60 years, until 1989, Poland was a communist state in the Soviet sphere and the Warsaw Pact, the organization formed by the Soviets to mirror NATO.